This set of two Fake Security Beams imitates the photoelectric sensors that are used in most high end security systems today. Criminals know that these sensors are placed across from each other to cause an invisible beam to pass between them and if that beam is broken the alarm system is triggered. The criminal will think that you have a high- end security system installed and go in search of an easier target. 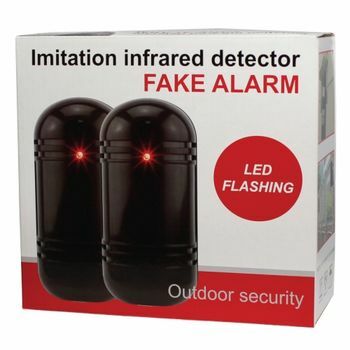 These fake sensors have red flashing lights on the front of them that will draw the attention of anyone that steps foot on your property. Includes wall and pole mounting hardware. Each unit requires 2 AA batteries (4 total).